Our team specified and participated in the setup and installation of a state of the art HD video conferencing system. 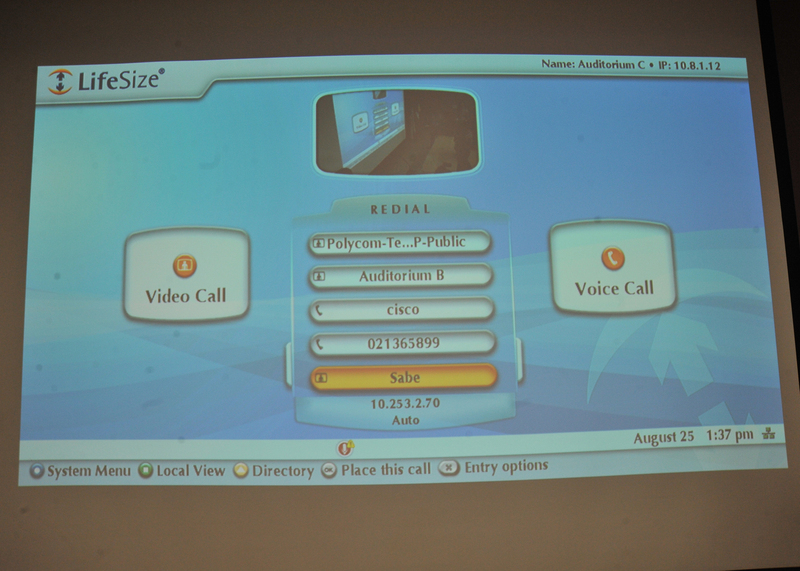 The video conferencing sessions can be initiated from the auditoriums in buildings C and B, the lab in building D, the meeting room in building A, as well as a classroom in the SABE as each of those rooms is equipped with a full HD camera, codec, microphones, and high quality sound systems. The codecs in each of those rooms may be used to communicate via our Intranet with the video management software, that is running on a central server in the data center, in order to establish point-to-point (e.g., classroom to auditorium) or multi-point (e.g., more than two rooms in different locations) video conferencing sessions amongst them or with any other location in the world. This system can bring GJU staff, students, and others at different remote locations together via simultaneous two-way video and audio sessions. Hence, people at different locations can interact verbally and visually together without loss of time and money to travel to a common location. For example, students in SABE can join a lecture in the Auditorium in C without the need to drive from Jabal Amman to Madaba, and our President may join an important meeting at GJU while he is abroad.